Born and raised with the Sisseton Wahpeton Sioux Tribe in Northeast South Dakota. Also a Hunkpapa Lakota, Allison is a Media Consultant/Political Activist, and more recently someone who took a #StandWithStandingRock. 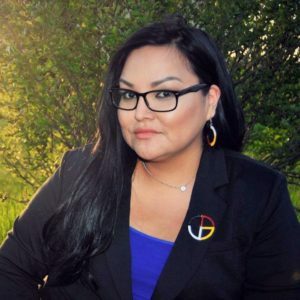 Currently involved in the South Dakota political scene, she has plans toward public office and hopes for community empowerment in 2018 and beyond. Founder of #DakotasForAmerica, she is also taking on the task of continuing the progressive political platform and an interdependence style of action. Ms. Renville was also a National Bernie Sanders delegate attending the 2016 Democratic National Convention and continues to advocate for Native issues and political participation.